"It's as if we're taking a piece of clay and turning it into gold, and when the laser pulse goes away the gold goes back to clay," said Thomas Devereaux, a professor at the Department of Energy's SLAC National Accelerator Laboratory and director of the Stanford Institute for Materials and Energy Sciences (SIMES), a joint SLAC/Stanford institute. "But in this case," he said, "our simulations show that we could theoretically change the electronic properties of the graphene, flipping it back and forth from a metallic state, where electrons flow freely, to an insulating state. In digital terms this is like flipping between zero and one, on and off, yes and no; it can be used to encode information in a computer memory, for instance. What makes this cool and interesting is that you could make electronic switches with light instead of electrons." 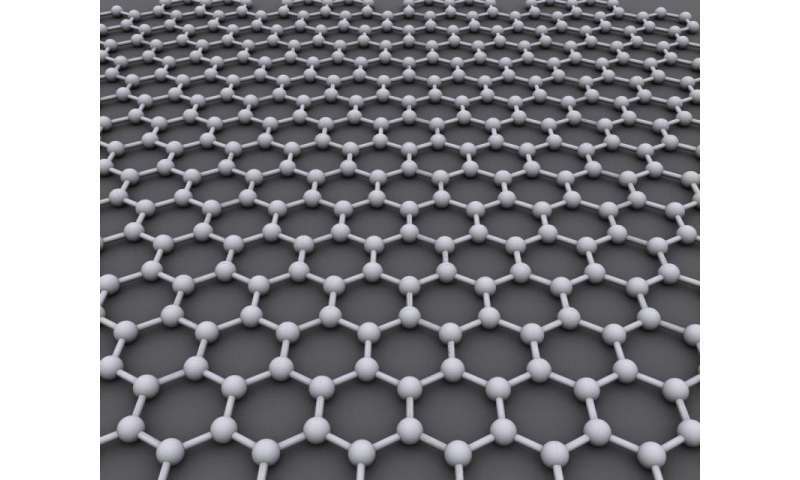 Graphene is a pure form of carbon just one atom thick, with its atoms arranged in a honeycomb pattern. Celebrated as a wonder material since its discovery 12 years ago, it's flexible, nearly transparent, a superb conductor of heat and electricity and one of the strongest materials known. But despite many attempts, scientists have not found a way to turn it into a semiconductor – the material at the heart of microelectronics. An earlier study demonstrated that it might be possible to take a step in that direction by hitting a material with circularly polarized light – light that spirals either clockwise or counterclockwise as it travels, a quality that can also be described as right- or left-handedness. This would create a "band gap," a range of energies that electrons cannot occupy, which is one of the hallmarks of a semiconductor. In the SIMES study, theorists used the DOE's National Energy Research Scientific Computing Center at Lawrence Berkeley National Laboratory to perform large-scale simulations of an experiment in which graphene is hit with circularly polarized pulses a few millionths of a billionth of a second long. "Previous studies were based on analytical calculations and on idealized situations," said Martin Claassen, a Stanford graduate student in Devereaux's group who made key contributions to the study. "This one tried to simulate what happens in as close to real experimental conditions as you can get, right down to the shape of the laser pulses. Doing such a simulation can tell you what types of experiments are feasible and identify regions where you might find the most interesting changes in those experiments." The simulations show that the handedness of the laser light would interact with a slight handedness in the graphene, which is not entirely uniform. This interaction leads to interesting and unexpected properties, said SLAC staff scientist and study co-author Brian Moritz. Not only does it produce a band gap, but it also induces a quantum state in which the graphene has a so-called "Chern number" of either one or zero, which results from a phenomenon known as Berry curvature and offers another on/off state that scientists might be able to exploit. Dichalcogenides are the focus of intense research at SIMES and around the world because of their potential for creating "valleytronic" devices. In valleytronics, electrons move through a two-dimensional semiconductor as a wave with two energy valleys whose characteristics can be used to encode information. Possible applications include light detectors, low-energy computer logic and data storage chips and quantum computing. In addition to the work on graphene, members of the research team have also been simulating experiments involving the interaction of light with dichalcogenides. "Ultimately," Moritz said, "we're trying to understand how interaction with light can alter a material's character and properties to create something that's both new and interesting from a technological point of view." It looks like this stuff is here to stay. But we know almost nothing about its properties when injested, or anything else. I feel like we are setting ourselves up for a nasty surprise. First, let's make sure that thing is gluten free. Jokes aside, we'll have to take extreme caution with that indeed. If this stuff is here to stay, and damn it wouldn't be a bad thing, we should at least make sure it's safe. As much as possible.